Having a hard time finding talent? You're not alone if you are having a hard time finding a talented Ruby on Rails developer or two for your new venture, or data expertise to help you make sense of your rapidly growing pool of customer behavior data. Apparently, a hiring boom is emerging in the US technology industry, and talent is once again scarce. 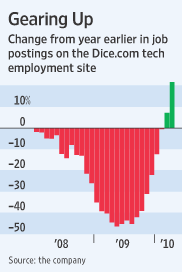 The discrete turnaround is particularly apparent in data from Dice.com, a site that traditionally has a focus on independent contractor IT job postings. 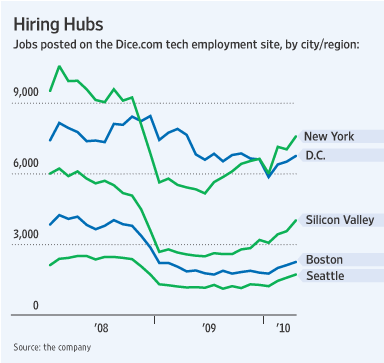 New York, Silicon Valley and San Francisco have actually been growing in demand for some time. But now the trend is starting to appear across the country and the coasts are just seeing their markets get hotter.